Jeremy's notes: A wonderfully designed and implemented worker placement game using dice. Incredibly easy to teach and learn, yet robust enough to afford experienced players numerous strategic opportunities and possibilities. Wonderful components and production values. When I got into board gaming I read a lot of subjective articles ranking writers’ opinions of the “best” the hobby has to offer. The two names I saw most frequently residing at the top of these lists were Power Grid and Alien Frontiers. I spent a lot of time looking into both games; I ultimately decided that Power Grid was not for me (I do “economy” professionally, so I want nothing to do with it leisurely), and that Alien Frontiers, while most certainly for me, was a game I’d have to work up to. I threw it onto my Wish List and forgot about it for 6 months. When I felt I was ready to tackle something as “daunting” as worker placement (I was very new to boardgaming at the time, so even mechanics I’d now deem simple seemed too complex), Alien Frontiers was out of print and going for over $100 on eBay or Amazon. I was finally able to get my hands on it a few months ago when the new printing became available. So is it among the best gaming has to offer? A quick disclaimer: everything in my review pertains to the most recent edition of the game (the 4th edition, funded on Kickstarter in 2013 and released to retail April 2014). This combines the contents of the original base game with the contents of the Upgrade Pack (domed plastic colonies, plastic miniatures for the Field Generators and dock cover chits for 2 and 3 player games), and includes awesome tuckboxes to store all the parts. It also contains a 2-sided board – one side identical to the previous editions, the other with “rocket dice” shaped docks to work with Game Salute’s rocket dice to be released later this year. The only “putting together” you have to do when you first open Alien Frontiers is assembly of the tuckboxes and organization of the parts into them. It’s a task that takes around 10 minutes. The rulebook is straight forward – particularly if you have prior experience with worker placement games. I started my first game around an hour after opening the box, and it lasted around an hour and a half. Setting the game up for repeat plays is simpler than some other worker placement games – no more than 10 minutes work. My games – whether 2, 3 or 4-player – have always taken between 1 and 2 hours. If you have prior WP experience, getting good at Alien Frontiers does not take long. You really just need to get comfortable with the available Alien Tech cards and develop a strategy around managing the board. If you have no prior WP experience, your first handful of games will be dicey. My first WP game was Lords of Waterdeep, and most of my decisions were pretty embarrassing for the first 4 or 5 games. Teach time is relatively quick, even when teaching to somebody who’s never tried worker placement. Alien Frontiers is so elegantly designed that the board itself – while highly thematic – manages to cram in most of the instructions for the game in logical symbol-based form. No more than a half hour is required to teach someone as long as you are already familiar with the game. Of every game I’ve played, this one feels the most classification-proof to me. The only tough sell may be to power gamers, but they should be able to forgive the shorter playing time given the thematic immersion (although I’m sure they’d prefer Eclipse). My friends who hate Euros love it because they’re playing a science fiction game; my friends who hate theme-heavy/mechanic-light games love it because they’re playing a real Euro. Unfortunately, until the new edition’s expansions make it to retail (supposedly end of 2014) I can only play with 3 others. The bigger my gaming circle gets, the more I appreciate games that can support at least 6 players – and right now, Alien Frontiers is limited. There is nothing above a PG rating in Alien Frontiers, but it’s not a game I could see playing with a child. While extremely thematic, the “science fiction” is more 60s B-movie than Phantom Menace, and I believe only adults appreciate B-movies. The game mechanics and strategies are also a little advanced for children, and there is no way I can see to “dumb it down”. I would tab this exactly at the 13+ manufacturer’s recommendation. There are two titles that immediately grab me as comparisons to Alien Frontiers: Kingsburg and Euphoria. Kingsburg is definitely the gateway game that would lead to the other 2, and is likely to get shelved once you’ve graduated – even with the expansion, it’s got far fewer options than the others, and a flimsier theme. But Euphoria is real competition for Alien Frontiers. They are both thematically and strategically rich, and they use the same means to mitigate the randomness of dice rolling. Euphoria is the more complicated game, but I prefer Alien Frontiers overall. You can’t go wrong with either, but Alien Frontiers flirts with gaming perfection. Alien Frontiers – particularly this stunning 4th edition – has proven well worth the wait. I’ve played it several dozen times in the few months I’ve owned it, and don’t see it slowing down any time soon. The theme catches you in a manner that few Euros can, and the experience will only get richer when the rocket dice become available later this year. This is a game that everyone should have in their library. Lately I have come to discover that I have a soft spot in my heart for games that use dice. I like to leave certain things up to chance, because sometimes in life you have to take risks for great rewards. There are simple dice games and there are games that only use dice as a means to an end, but rarely is there a game like Alien Frontiers, that makes the dice a central theme to the game, but doesn’t FEEL like a dice game. The game itself is themed around colonization and construction. There is no actual space exploration; everyone is in the same sector (as it were) and trying to gain control of territories on a planet. They do this by building colonies on the planet, and when one player has built their final colony on the planet, the game is over and the winner is determined by points on a victory board tracker. For each colony established, the player gets one victory point. If the player has control of a territory by having the most colonies, they get an extra victory point. Pretty simple, right? You need materials to build your colonies, however. And that means navigating your ships around the board. The dice themselves are the ships, you see. You start off with three dice, and by rolling those dice, you can pilot your ships to certain areas of the board. At the solar converter, you can dock a ship to get fuel according to the value of the die you roll (1-2 gets you 1 fuel, 3-4 gets you 2 fuel, and 5-6 gets you 3). At the lunar mine, you can get 1 ore for any value of die, but you can only dock a ship there if your ship/die has a higher or equal value than the highest value die already there. These resources are important, as almost everything in the game requires their use. Once you have resources, more options become available. If you roll doubles on three dice, then you can place those two dice at the shipyard, where spending a fuel and an ore will build you another ship (i.e. getting another die to roll). You can build up to three ships, giving you a maximum of 6 dice to roll (although there is a way you can roll 7 in the game). Each subsequent ship costs one extra fuel and ore to build, so getting your fleet is an investment. But with more ships also comes more options. In order to build a colony, you can construct one at the colony constructor if you roll three of a kind and have three ore to spend. Or you could go the slow route and place a ship or two at the Colonist Hub to gradually gain the chance to build a colony for one fuel and one or. Or, if you’re determined to plant down a colony on a territory before anyone else, on a roll of a 6, you can destroy that ship and spend one fuel and ore at the Terraforming Station. Why would you want to do that? Because with the territories comes unique advantages for the one that controls that territory. Named for various science fiction authors and personas, each territory can grant unique abilities. The Pohl Foothills can make the use of alien tech cost one less fuel per use, which means that some alien tech can be used for free at that point. The Bradbury Plateau allows you to construct a colony with the Colony Constructor with one less ore. And the Burroughs Desert contains the Alien Ship which you can use by paying one fuel and one ore (giving you 7 if you already have your full compliment of 6). You heard me mention alien tech just a moment ago; the game also has cards that represent alien technology. You can get alien tech by landing on and using the Alien Artifact location, and this tech can affect the game by allowing the user to manipulate dice values, reuse ships, and even gain victory points outright. There is also a way to steal technology and resources from an opponent, by using the Raider’s Outpost. It’s not nice, but hey, they’re raiders, right? There are just so many options in this game that there is always something that you can do, and you’ll find that this game brings out the creative side in you. You’ll learn to do calculations in how to make your ships the most effective with any roll that you get, and there are so many strategies to employ that the game doesn’t become stagnated or predictable. This game is good head to head against someone or in a four-way free-for-all, and the ease of setting up the board and putting it away is an added plus; there hardly seems to be any effort involved. In summary, this game is simple to get a handle on in the rules department, but also complicated enough to formulate strategies and remain interesting and innovative. As far as dice games go, I think this is one of the best around. Alien Frontiers is one of my favourite worker placement games, I am a fan of dice rolling if it’s done correctly and I tell you Alien Frontiers has a pretty awesome way of integrating dice rolling and worker placement into one game. Your workers (spaceships) are your dice, and at the start of your turn you will roll all your ships. Your ships can go to any location although some require doubles / triples, a certain number or a run. The location determines what action you will carry out, and the number on your ship determines the details of the action. The details would be how much of a resource you collect, the trade value of your resources, if you can launch a colony, and if you can buy an alien tech card. This game has so many different strategies to it that there is a way to play that suits each player’s personal style. There are 3 different ways to place colonies onto the planet and each of them can be activated by a different combination of dice and resources. In Alien Frontiers you are not ‘screwed’ by your dice rolls instead your dice rolls leave you with strategic choices and a good player can turn the crappiest rolls into a victory! Each location however can only have a limited number of ships in it. This makes for even more strategic choices especially when you are blocked from the resource or location that you really want. There are lots of mechanics that allow you to tweak the way you play this game and give you the edge over your opponents. This works great to counter ‘being blocked’ out of a location or resource. Alien Tech Cards: You can purchase these by docking ships with a value equal or greater than 8 at the alien artifact. You can discard the current cards for sale and get 3 new ones by placing any value ship in the alien artifact. In addition to granting you some powerful abilities Alien Tech Cards can also be worth victory points. Territory Bonuses: The player with the most colonies on a territory gains its bonus. If there is a tie the player who previously had the bonus must return it to the territory until the tie is broken. In addition to giving a bonus action, dominance over a territory also scores you a victory point. Although the colony markets are kind of cheesy they serve their purpose. The tiles awarded to whoever asserts their dominance over a territory are good quality and they have their special ability printed right on them. The cards are fairly standard although they are a pain to pick up I would recommend sleeving them for sure. One thing that sets this game apart from others to me component wise is there is no colour I don’t want to play. The dice / matching colony tokens are all a sort of off colour that I find more attractive than most games. Alien Frontiers is clearly not for everyone, or is it? Family Gamers: Although this is not family friendly where anyone can walk up and buy it off a shelf take it home and play with their kids, if your family is experienced with board games this one isn’t too hard. After a couple turns pretty much anyone can get the hang of it and with the right guidance this can be a great game to improve critical thinking skills. The space theme works for some kids / families, for others it doesn’t if your family is experienced with board games and or enjoys the science fiction theme you should check this game out. Casual Gamers: There is a lot of strategy, planning and thinking in this game so if you plan on playing a game with some dinner guests this is not the one. However if you are trying to lead some casual gamers towards more in depth games this is a great game to use. It is pretty rewarding to see your strategy come together and after a couple turns, tech cards, more ships, and a territory bonus you can see your plan come to life. This is a great part of any game and is what gets people ‘hooked’ and wanting to play more of that game. There is enough customization / personal strategy that there is room for multiple play styles, however because there are a limited number of spots at each location you are sometimes forced into locations and this keeps the vast amount of choices available to you from becoming overwhelming. Gamer Gamers: This is a great worker placement game, there are lots of different strategies that can be used to obtain victory. One thing Alien Frontiers does better than other worker placement games is it really gives you the ability to ‘screw over’ your opponents. In a family setting this would obviously not be your first choice of action however at the local games night with a group of avid gamers this is what turns this game from your typical worker placement into a game for strategic masterminds looking to find a balance between blocking opponents and scoring points yourself. Dice haters might be turned off but usually if you low roll in a game you are stuck with ****** results and thats why dice haters hate, however rolling low is not always a bad thing and tech cards allow you to add, subtract, flip or move points around your dice and your workers being your dice actually adds a unique element to Alien Frontiers. I do not live under a rock, so I have heard of Alien Frontiers, and I have heard a lot of reviewers I respect say good things about it. It has always been on my “buy” list, but there always seemed to be a game I wanted more. Theme: Space! I love science fiction in general and space in particular, so I was hooked. The design integrates theme very convincingly. Even the “dice as space ships” mechanic works, although I bet that’s even more evocative with the upgraded dice that are available. Components: Top notch, nice chunky dice, solid wooden bits, even a little plastic space ship. Add to that the absolutely stellar art design (a gorgeous combination of form and function), and you have a winner. My only quibble is with the cards. They are of fine quality, easy to read with nice artwork, but the background color is a stark white, which to me makes them seem slightly at odds with the rest of the color scheme. Rules: I cannot speak to their quality in terms of learning the game, as I was taught in my first play, but in two subsequent playthroughs with a friend who was also a newbie, we had no trouble finding answers to our questions. Time/Space: The game has a fairly standard footprint. Should be easy to play on your typical card table sized surface. It you have a dice tower or other dedicated place to roll the dice, that will help. You do NOT want to roll your dice on the board. The games plays in a very satisfying time frame; a table of 4 inexperienced players learned the game and played in through in less than 2 hours. In 2 two-player games, one a learning game, we played twice in two hours. Game Play: I am not going to go into a lot of detail describing game play, as this game has been around for a while, and other reviewers have covered this at length. Just take a look at the other reviews here and you’ll find out everything you need to know about game play. Number of players: I have played two player and four player, and both have interesting dynamics. In two player, the sense of “take that” is more intense, since there is only one target of any such action. In four player the game has less direct back and forth, but the frustration around limited available courses of action seems more prevalent. Complexity: Deceptive. The mechanisms themselves are not complicated, and they blend well with the theme to generate a good common sense basis for understanding how the game works. Goals are clear, and there is almost no hidden information, so knowing where you stand and what you need to accomplish is apparent. The challenge is in the HOW. Discovering and understanding the interaction of the mechanisms is the most difficult part of the game, and also the most fun part of it. That said, the game could certainly induce analysis paralysis in some players, especially in early playthroughs. To provide some context I would say that anyone who can play Catan or Lords of Waterdeep can easily play (and enjoy) Alien Frontiers. Final Thought: As I said, I love this game. The goals set before you are very straight forward – almost seems simple. The trick, as I mentioned, is in the How of accomplishing the goals. There are a lot of choices to make, and your power to manipulate your situation is entirely based on what you decide and plan for. Sure the dice rolls every turn definitely set limits, but there are so many ways to mitigate that luck factor that a good player can win even with “bad” rolls. I have only played this game three times, but each time I figured out some new way to “work the system” to overcome obstacles (if not opponents). The only tragedy is that game is currently out of print, and will not be available again until approximately November. If you haven’t played this game yet, go find a copy and play, or get in line (behind me) in November. Alien Frontiers, developed by Clever Mojo Games, is a great space themed game that utilizes its mechanics well for a solid game play experience. The components for this game are extremely well done. The board looks great and also offers a lot of information, utilizing language independent icons. Dice are used in 4 different player colors to represent spaceships. Each player also gets small wooden tokens in their color to represent colonies they place on the board. A small handful of cards are used to represent Alien Technology that players can acquire to interact with the game and their ships. There are also wooden tokes to represent fuel and ore, which are collected and used to pay for various things in the game. Dice Rolling – Yep, the “dreaded” DR phrase. It’s actually one of the core mechanics of this game. But it works really, really well. And with the right Alien Technology cards you can manipulate the dice to use them effectively. So yes there is some random element involved since you have to roll the dice, but there are ways to control it a bit. If you like Kingsburg and games like that, this mechanic will not bother you and I think you have the potential for more control of the dice in Alien Frontiers than you do in Kingsburg. Territory Control – As you place your colonies, you’ll be thinking about if you can gain control of a territory, or if you can at least make it so no one has control. The reason for this is the player that has control of a territory gets an additional victory point and bonus abilities to use during the game. The moment they no longer have more colonies than anyone else (so even on a tie); they lose both the bonus abilities and the victory point. Placing your colonies and gaining control of territories are the two main way to gain victory points for the end of game win. Worker Placement – In this case your workers are spaceships. Your choices for where to place those spaceships each round are determined by: what you roll, what you can manipulate on those rolls, and what areas are still open for ships to dock. Like most worker placement games, most areas on the board do not have enough spaces for everyone to use them. So you might have the perfect roll for something, but without an open spot to dock your ships you are out of luck. This adds a bit of a cut throat strategy element as well. You can use worker placement not only to your benefit, but also to your opponent’s detriment. If you like Kingsburg but wish it would move a little faster, or don’t like Kingsburg because of the slow pace, this might be a game to check out. The Worker placement isn’t as “round robin” as Kingsburg. You place all of your ships/dice on your turn and they stay in their spot until your next turn. The next player will remove their dice, roll them, and then work with the open areas on the board. So there’s less wondering if you need to take a spot or if it will still be available for your remaining dice. You place all your dice, work with the spots that are open, and you’re done. Yes, there can be some Analysis Paralysis, but it’s minimized greatly next to the amount I’ve seen in some Kingsburg games (I enjoy Kingsburg, don’t get me wrong). Fluctuating Scoring – As mentioned above, having control of a territory gets you extra victory points, but losing control will also make you lose that point. There are also a couple of Alien Technology cards that will give you victory points as well, but those can be stolen. So your score is not a fixed element in this game. And you will be thinking not only about how you can gain points, but also how you can make your opponents lose points as well. Variable Powers – Between the Alien Technology cards and the Territory control benefits, you will have variety of tricks at your disposal. And all of them can be taken away just as fast as you gain them! This helps make the game a bit more cutthroat as well. And it’s one more thing to be thinking about. Sometimes you’ll make a play to gain an ability and other times you might make a play just so no one has that ability for a turn or two. Almost all the Alien Technology cards have a “pay to use” ability and a “one time; discard to use” ability. So the cards can come in and out of play easily. There’s also a spot on the board to dock ships that allows you to steal cards from other players. So the additional abilities will be in constant flux. I really, really like this game. I love that it plays pretty fast and allows for a lot of manipulation of the dice. The cutthroat aspect of controlling territories for extra points and abilities is pretty nice as well. It makes for some contention and makes you think about the best placement of your limited colonies. From a teaching aspect, this game is great as well. I was able to grab the game, read through the rules, and teach it to a new player that same night. There was minimal referring back to the rules, and when you do have to refer back; the rulebook is laid out nicely and I was able to find answers quickly. I have only found one rule that was being played incorrectly so far, and that was not the fault of the book. It was me not paying more attention to a territory that I never really go after. I will definitely add this game to my list of games to teach at game day events. No muppets about it, this is a sweet worker placement game that flows well. You take the role of colonists trying to build the best set of colonies on this new alien planet while harvesting alien technology to your advantage. The goal is to control enough territory to give you the victory. Components, board, and graphic design are very thematic. Can be Analysis Paralysis prone depending on players slowing the game down. Players begin with 3 dice (or ships) and one alien tech card. 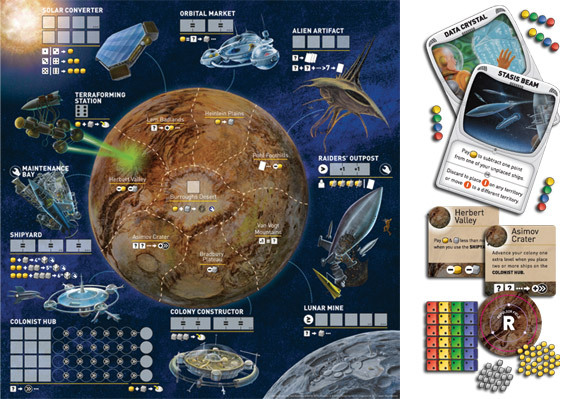 Each player takes their turn by rolling their dice once, and then determining where to place their dice on the board’s “orbital facilities” to gain resources, build ships, take items from opponents, draw alien tech cards, or place colonies on the planet. Each orbital facility details what rolls a player needs to obtain the facility bonus. During their a turn, a player can also use their alien tech cards to provide extra bonuses or resources depending on the card. Once a player is finished, they will leave their dice on the board until their next turn, and then collect them to perform their next turn. This makes the game very interesting, because your opponents dice may be occupying a spot you really need. Can we say “plasma cannon”? Basically, you’re trying to get your colonies on the planet. This requires you obtaining solar energy tokens and lunar ore to build colonies. As you place each colony on the planet, you get a point for each colony. Some tech cards also give you points as long as you can continue to possess them. The planet is also broken up into “territories” that grant the player controlling the territory with a bonus power that helps you in the game. Each planet territory, except the middle territory, is connected to an orbital facility, and the power is related to an advantage at that facility. There is also another element that lets you mess with other players territories by manipulating the field generators through alien tech cards. The positron field will grant a player an extra point. The repulsor field will prevent players from adding colonies or moving colonies to and from that territory, and the isolation field nullfies a territory’s bonus. These generators can also be stacked on the same territory to really hose someone over. Play continues until someone places all their colonies on the planet. Once that is done, everyone will total their points, and whoever has the most points will win the game. I really enjoy Alien Frontiers, and I’m glad I finally got my hands on a copy. This was definitely worth the hype and wait, although I wish Game Salute would sell this through other channels. The fourth edition is definitely a step up over the first edition components. The colony tokens are very thematic. The game provides lots of interesting decisions each round and has some nice player interaction capabilities through tech cards and raider’s outpost. I like how there are basically three ways to get colonies on the planet, and each of those ways require differing levels of higher cost based on how quickly you can put the colony down. However, because it has a decent size decision space, players who are analysis paralysis prone can really slow the game down. That’s why I’ll probably never play five players if I ever get the “Factions” expansion. Four players is really the maximum for this game, and I would almost say three players may be the sweet spot. My two older kids liked the game as well. My youngest is just learning to read and doesn’t like to wait around between turns, so your kids need to be comfortable reading and waiting for playing. It does make a good family game given that caveat. All in all, Alien Frontiers is a great game worthy of your collection. Family Gamer – YES – Given the age of kids, nothing offensive, and good strategy. I will give a brief review in the following categories. Component quality, theme, learning curve, suggested number of players, interaction, re-playability and fun factor. Quality of all the components is very well done and has nice artwork. In my opinion the space theme comes through very well. When I bought a card and used it I “felt” as if I was actually using whatever was on the card. Might sound a bit odd but I was really pulled in by the theme. Very easy to learn. Within 5-10 minutes you have learned the basics of the game. Two players is fun but the “screw you” component of the game is lost. Plays better with 3-4 players since no one really knows who is going to screw them over or when it is going to happen. Lots of interaction and lots of “screw you” in the game also which I LOVE. Laughter, groans, etc. It’s all there. Very good re-playability. There is so much interaction and so many strategies to try out that it keeps the game quite fresh. This is one fun game. Great interaction, lots of strategies to try out, some nice “screw you” cards to play and overall just a simple, fun game. For all you new gamers out there. There are times you are going to play a game for the first time and love it. There are other times you are going to play a game for the first time and not think to much of the game. When that happens play it some more. When you do this you will learn the game in more detail including the mechanics and strategies. When this happens a game that you did not like on the first game play you might like once you really get the “hang” of it. I recommend playing a game at least 3 times before making a final judgement call on it. In this game all players are competing to colonize a planet, but in order to achieve this, they have to manage the two resources available (energy and ore) as well as make smart use of different stations orbiting the planet, which by the way, have different purposes, like for instance: allowing you to extract resources and/or, buy ships, place colonies, exchange one type of resource for other, buy alien technologies, etc. And, how do people use the orbital stations? Easy, with dice!!!. Each dice represent a ship which can be placed in the different slots in the board game. Yes, that´s right! You start with 3 ships (3 dice). Later on, you can build new ships to a maximum of 6. However, each time they are more expensive to build. The interesting thing about the ships, is that the most you have, the more you can achieve in a single turn due to more options that become available to you. Each turn you roll your ships, and depending on the results you can use them at different orbital stations if they happen to be unused (yes, sometimes you may not use an orbital station if others are there). For example, in order to use the shipyard, you need a double (does not matter the number you rolled), but if other players are using the station completely, you may not be able to use it at all, unless.. -and here comes the exception to the rules-, you make use of some nasty alien technologies to remove or destroy other player´s ships from a station, or use them as yours. Alien cards are extremely powerful and most of the time they allow you to bend the general rules. In fact, although there is luck involved in the game, it is controllable by using these cards. And for those of you who like confrontation and direct interaction with other players, you can always steal resources and alien cards from other players by using a special orbital station (kind of a pirate lair), provides you a string of number in your ships. Something worth to be mentioned is that not necessarily the person who places his last colony is the winner. There is a scoring track which goes up and down during the same. * Various mechanics going on: resource management, worker placement, area control. * You need to get familiar with the alien cards in order to understand the hidden strategies inside this jewel of a game. 1. It’s too easy to hog the two most powerful spaces: stealing and terraforming. With the right alien artifacts, you can hold a monopoly on these spaces, and easily dominate the game. 2. The game suffers from a version of middle child syndrome, where it’s not quite a casual game and not quite a solid strategic one either. True, it does have elements of both, which can be a good thing, but it’s a bit too long to be casual, and it’s too random (both from dice rolls and opponents randomly stealing what you have) to be strategic, and I wish it was either one or the other. 3. There’s too much time between turns. Since you won’t know what you have to work with until it’s your turn and you roll, there’s nothing for you to do but sit and wait for your turn, and if your opponent’s the kind to take his time, it can get really boring. All that said, there is a lot of great aspects to the game. The gameplay is streamlined, balanced, and a lot of fun. I just wish it was either a bit deeper, or a bit quicker. This game scratches a lot of itches for me – worker placement, dice, and sci-fi. I have the 4th edition proudly displayed and played many times. I love it very much. Based on the reviews on this site, I purchased it, and due to the policy of the publisher (which may have recently changed) of not allowing it for online sale, I went to many retailers to track it down. It was very worth the time invested, as the gameplay is top-notch. My main criticism is that it’s too good – it has spawned eleventy-billion expansions, some of which are okay, but none are as strong as the core game. I see them available, and I remember how awesome the base game is, and I purchase them without doing any research. When they add little to the core, and I expel them in favour of the clean awesome core game, I get a bit of remorse. Not much, though. Initial quality of the game which is relatively low – can be improved by expansion packs that will give you plastic pieces in place of regular wooden tokens. Looking forward to my KS expansion packs for fractions. Great game, and my kids love it. They ask to play t all the time. You can order a set of replacement cards and get the space crane in the new set. Took it to a game night with some friends, taught it to them while we played our first game, they all really enjoyed it. They commented on the uniqueness of the die placement. Overall was a huge success. Cannot wait to buy the new expansion, really looking forward to be able to play with five players. 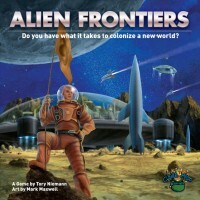 Add a Review for "Alien Frontiers"